These maps depict which trails and roads were created for accessing mines and prospect sites. I took the photos on the right at various mine remnants in the area. These maps and text outline my proposed consolidation and "zoning" of the trail system within the Golden Horseshoe. I took the photos on the right while exploring trails in the area. This image portrays two representative trail sections that users in the Golden Horseshoe might experience: high-altitude passes/slopes and mountain forests. The characteristic habitats and flora and fauna of the trail section represented are drawn schematically on the right. This image accompanies the previous image, depicting in this case steep slopes and mountain wetlands. 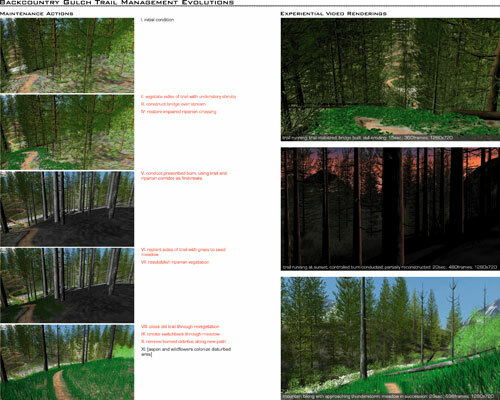 The images on the left describe potential trail maintenance actions that would lead to different trail experiences on a flume trail (found near town on the western side of the Golden Horseshoe). 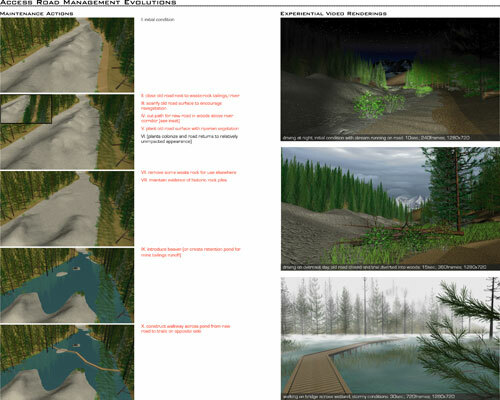 The images on the left are screen shots from the video renderings of each trail iteration. 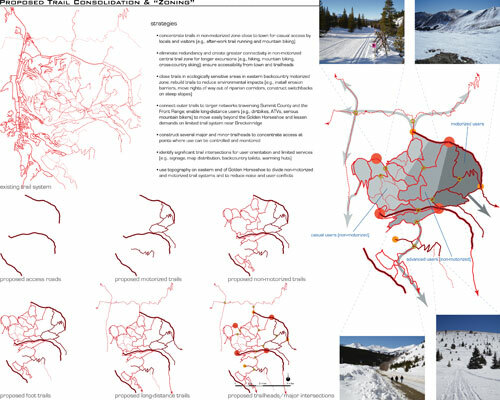 "A radically different way to look at a trail system and a brilliant use of graphic tools. The project pairs the exciting experience of the trail with a very realistic maintenance plan. " The Golden Horseshoe lies to the east of Breckenridge, Colorado. It became the focus of intense mining activity in the mid-1800s, from dredge boats turning over entire riverbeds to men digging shafts into the hillsides. Mining defined the landscape for many decades, and we can still witness its effects in the tailings piles and lodgepole monoculture that define the site. The road network that developed during the mining era was a chaotic and redundant labyrinth, which has subsequently evolved into a system of recreational trails used today by runners, mountain bikers, cross-country skiers, off-road vehicles, and snowmobiles. Due to the history of the area and a lack of management funding, however, the current trails are degraded and desperately need maintenance and consolidation. My project attempts to convey the immense recreational possibilities that exist within the Golden Horseshoe by looking at trails and their management not as a mundane, static structure, but rather as an evolutionary organism that intervenes in and draws its excitement from the ever-changing world around it. I hope to make officials in charge of the area, as well as local users, eager to work toward a consolidated trail system that is more fun for more people, while generating less harmful environmental impacts. 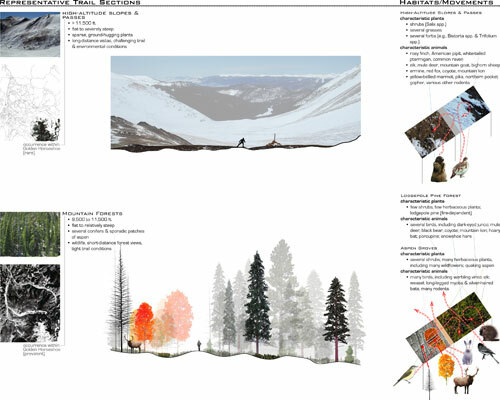 I presented this project to a studio jury composed of several design critics, as well as trail managers from the Town of Breckenridge, which was co-sponsoring our studio. I tailored the presentation to appeal to an audience not necessarily steeped in academic theories-I wanted fundamentally to communicate the joy and thrill of discovering a landscape through the experience of traveling a trail. To create a system that can deliver this joy and thrill requires innovative maintenance regimes and consideration of the users' ideal experiences. I decided that the critical element in evoking excited reactions to my project would be enabling people to see on a macro-scale how the system needs to change and then taking them on simulated trips through a series of potential trail evolutions. To show macro-scale network alterations, I used GIS data and aerial photography to create a series of digital maps (images 1 and 2), comparing historic and existing conditions with future possibilities that are not so specific as to seem unrealistic but not so vague as to seem hollow. 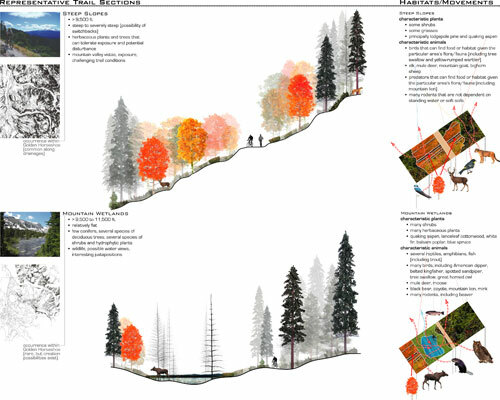 Zooming to the level of individual trails, I made a number of idealized trail sections and schematic depictions of habitats and ecological flows (images 3 and 4). These portray both human experiences and landscape characteristics. 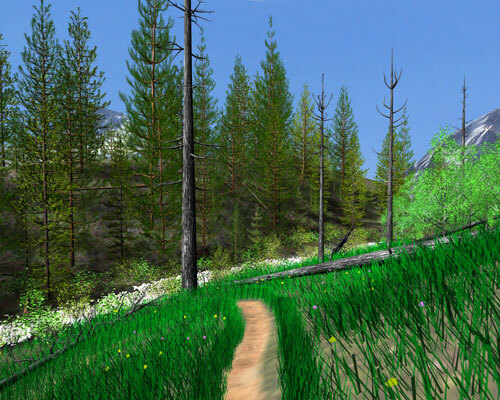 Recognizing, however, that two-dimensional representations could never capture the feeling of riding through a meadow on a mountain bike, for instance, I built nine three-dimensional digital models (three iterations each of three separate trails) and used these models to render videos that simulate the experience of passing along trail in the Golden Horseshoe. 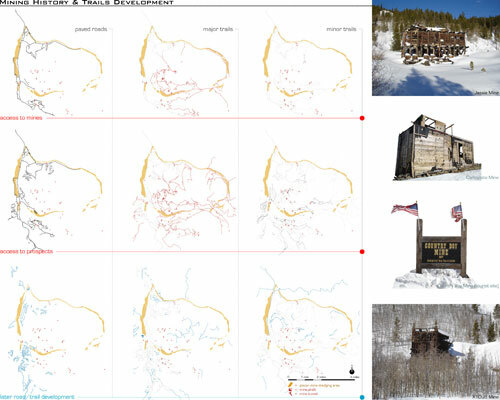 (Images 5, 6, and 7 depict the maintenance actions that would actuate my proposal; images 8, 9, and 10 are high-resolution perspectives rendered from the three "backcountry gulch trail" iterations.) My PowerPoint presentation follows the progression described above, and I showed each video simulation with Quicktime Player (on a separate plasma screen) after using PowerPoint slide transitions to demonstrate how the trails evolve. I hope the exhilaration that I feel when I go trail running or mountain biking will captivate the audience as it captivates me, invigorating them to revolutionize our approaches to trail management. In the same format as image 5, this image represents maintenance evolutions and video screen shots of a backcountry gulch trail (found toward the eastern end of the Golden Horseshoe). 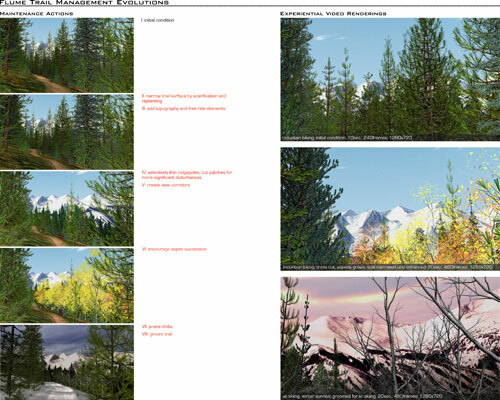 In the same format as images 5 and 6, this image portrays maintenance evolutions and video screen shots of a valley access road (found in valleys around the Golden Horseshoe). 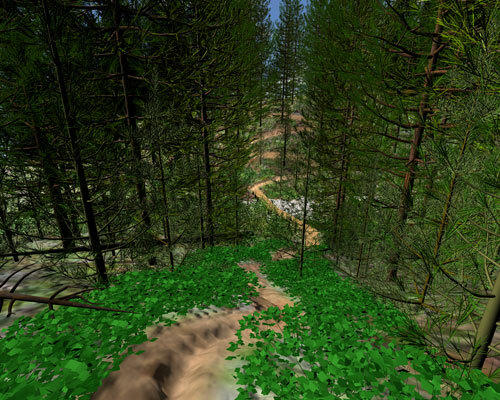 This image is a high-resolution rendering from the first iteration of the backcountry gulch trail (initial stabilization), looking down the eroded path toward the stream and bridge. 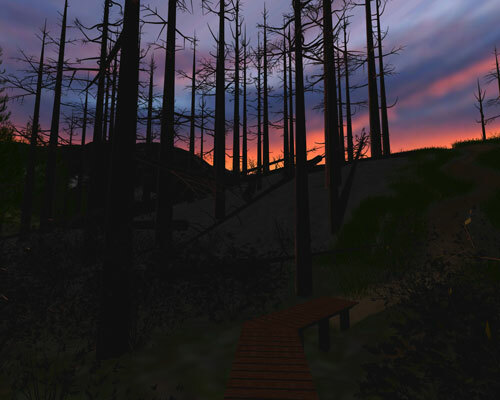 This image is a high-resolution rendering from the second iteration of the backcountry gulch trail (controlled burn), looking up from the bridge toward the sunset and distant mountains. This image is a high-resolution rendering from the third iteration of the backcountry gulch trail (meadow succession), looking across the meadow toward the stream and aspen stand.